Above picture is for illustrative purposes only. Product is OEM packaged and can only be sold with a new computer or components to biuld a new computer, please contact us regarding any questions relating to MS licencing, this is not supplied with disk, just licence. The Medialess License Kits are the licenses for Microsoft Office 2007 suites and components in the System Builder channel. 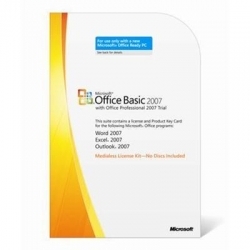 Microsoft Office Basic 2007 is the essential software suite for homes and small businesses that enables you to quickly and easily create great-looking documents, spreadsheets, and presentations, and manage e-mail. The latest release features a new streamlined user interface that exposes commonly used and familiar commands, enhanced graphics and formatting capabilities that enable you to create high-quality documents, new time management tools to help manage your schedule, and more reliability and security such as an improved junk e-mail filter to reduce spam e-mail. With these enhancements, Office Basic 2007 makes it easier and more enjoyable for you to get things done at home or work.